The Greene County Republican Party Central Committee on Thursday passed on endorsing Ohio Senator Rob Portman, voting instead to back the campaign of Don Eckhart, a Christian conservative opposed to marriage equality. 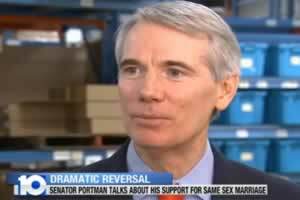 In 2013, Portman announced that he supports his gay son's right to marry, infuriating conservatives such as Phil Burress, head of Citizens for Community Values, who vowed to derail his reelection to the Senate. The group conceded that Eckhart, a perennial candidate, was a protest candidate.